ScienceDaily (2009-07-21) — A new study suggests that we can improve city environments by planting trees down the middle of streets provided they are not too close together. Too many trees planted close together along a central strip, as is common in many major European cities could lead to more vehicle exhaust fumes being trapped in the urban canyon than would occur if there were no trees. 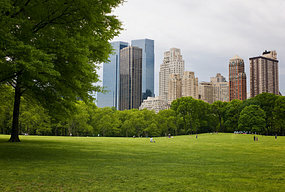 Although the findings of this study present a reason to limit tree density along city streets, initiatives like MillionTrees NYC should not modify their efforts to increase NYC tree canopy coverage. The suggested cost associated with too many trees along city streets is outweighed by the long-term benefits that come with increasing foliage density. Aside from aesthetic value, some benefits that trees provide include: reduced urban flooding, an offset to the urban heat island effect, reduced local energy demand, and increased overall air quality. These benefits will continue to increase through time as more trees are planted, while the negative impacts purported by this study will decrease as urbanites shift to sustainable alternative modes of transportation. Instead of viewing the results of this study as a reason to reduce tree density along city streets, the findings should encourage the implementation of higher emmision standards to deal with the heart of the problem. Imposing unnecessary limits on tree density in urban areas would unduly prevent their maximum possible benefits. View an ABC Science report of a study that quantifies the costs and beneftis of planting trees here.